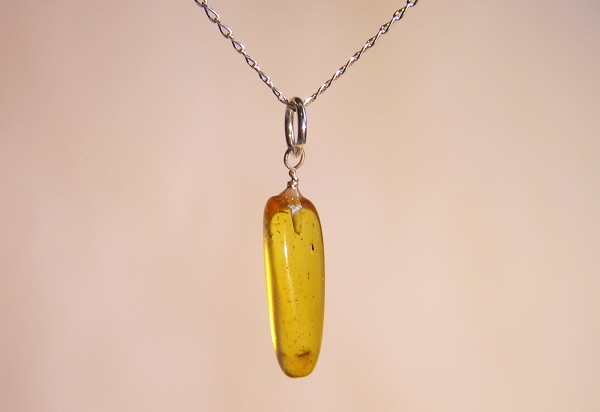 << Back Baltic Amber Necklace - Containing A Real Insect! This is a very special necklace and I only offer these once or twice a year. Baltic Amber is very common, but amber necklaces that contain actual insects are FAR from common. The pendant measures 2cm top to bottom - and is strung from an 18 inch Solid Silver chain and comes in a stunning padded, velvet lined jewellery box. This amber is Baltic Amber and would have been created about 35-40 million years ago. It would have started life as sticky sap running down a tree in a swampy forest. This forest would have been populated with strange and magical creatures. After the time of the Dinosaurs but still an amazing time!